Ex Hot Girl: Don't Just Do It. So... I went to the gym today to do a little run/walking and then go to Zumba at 6. Well, apparently I have my schedule all messed up and Zumba is at FIVE on Wednesdays, ant at 6 on Thursdays. So, I showed up about 20 minutes into the Zumba class and decided to just run/walk instead. I walked at L3.6 for the usual 6 minutes and then planned to run my 3 minutes at L5. I got to 2 minutes and my shins and calves were killing me. I decided to do a slower warm up, thinking that would help. I went ahead and went back down to L3.4 to walk for another 6 minutes. My legs still hurt but I thought "Don't be a wuss, Jenn" and I tried to run again. I ran 1 minute and my shins and calves were hurting so much that I had to go back down to L3. They still were killing me, so I stepped off of the treadmill belt onto the sides and just stood there for a minute. I went back on and walked for about 6 more minutes. I was feeling a little better, so I ran for 1.5 minutes again, and this time did it at L5.2. I was thinking maybe the slow jog was worse for me than a little faster of a run. But, at 1.5 minutes I was in pain again so I just went down to L3 and walked. I slowed it down to 2.7 and cooled down. Overall I was only on the treadmill for 30 minutes, and I probably only burned around 300 calories. I had my heart monitor and watch but I forgot to start recording my workout time. I did it about 1/2 way through and it said I burned around 150 calories, so double that I figure is about right. I've read from a few runners online that one day between running is the perfect amount of time for your body to recover from the run. Today was my 3rd day in a row of running and walking. I just enjoy it so much that I kept wanting to do it. I guess I am pushing my body too hard. It's not about my heart rate or my lungs... it's my shins and calves. I don't have shin splints -- I mean, I can walk just fine tonight and it only took me about an hour after the gym today to recover to normal. I am skipping running/walking tomorrow. I'm going to do Zumba at 6, then Gravity at 7. That's two hours of working out! Then I'm going to do my run/walk on Friday and see how I feel. Anyone else have this problem with running? Or did you when you first started? Morning! Couple of things - I'm just starting out running and am just about running 20 min sections out on the road at the moment - I don't find I have problems out there, but 10 mins on the treadmill absolutely kills my ankle joints - I don't know what's different but I find the treadmill much harder on the joints, so it's possible that's a similar problem for you. Also, alternate days for runs definitely, but make sure you don't push yourself too hard trying to increase with each session. One of the guys I work with who is super fit (e.g he runs an hour on the treadmill, covering about 7 or 8 miles just for the heck of it) warned me that you should only up your efforts by a max of 10% per week for sustainable improvement without injury or burnout - just check your programme's not moving along too fast. Hey, I just wanted to ask you how your Zumba class was going...I was thinking about taking one for the summer, and just wanted to know how you like it. *please, come fallow me on project hot mommy. With my shins hurting - oh yes! A friend who takes aerobics classes told me to try this - and it does help: get a couple of styrofoam cups, fill them with water and freeze them. When they freeze they're perfect for massaging your shins. Or wash out an old roll on deodorant and use that to rub them. It sounds crazy but it helps! Every time I try to get into running I end up with some sort of ache, pain or injury. Of course, I think I tend to get overly enthusiastic and I try to do too much, too soon. 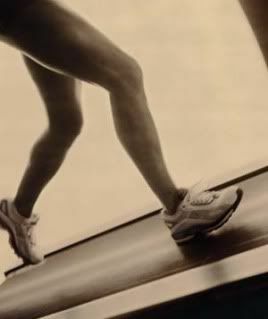 My shins hurt really the bad the first couple of times I started out running on the treadmill. I just kept getting back on and trying it again until eventually they quite hurting. However, I do find it so much easier to run outside than on the treadmill. Don't know the reason for this but I will take being out in the fresh air over a congested gym any day!! Stretch and stretch some more! I am just starting out with running and have to really stretch good before and after I run/walk. What kind of shoes are you wearing? It might be all about your shoes. That's what my PT told me. I was wearing Converses (worst choice of my life, because now my feet are all messed up). Also, if you have bad ankles in the first place, he said not to use Nike. And that the best choice in that case is New Balance. Also, I've read that running on dirt or something is much easier than running on a treadmill. That thing is really hard and gives you no bounce. I have had that happen to me. I am amazed at how much work you put in. I am so impressed and a bit jealous. I have to up my exercise game just to almost catch up to you.I cant wait til i can run faster. HEY!!!!! STRETCH!! What did your ol' buddy Andrew always say?? Stretch, at least 1/4 of your total workout time should be spent starting up with a deep stretch. Heres one for the muscle in front of your shin bone: Sit down, with your legs straight in front of you. put the heel of one foot on the top of the toes of the foot on the ground and push your toes away from you. at the same time, use the lower foot and try to push back against your other foot. STRETCH! and yes, the hurt will be there. go easy, warm up plenty, stretch before and after. DRINK WATER! drink at least 750ml before running, stretch, then run then drink more. hydrate, to motivate!